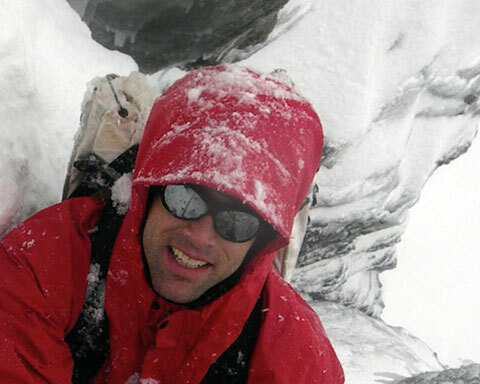 Blind Climber Erik Weihenmayer had a couple of talks to give in London, so he decided that it was a good time to visit Scotland and climb the legendary Ben Nevis. The blind climber may have summited Everest, but that seems only to have wet his appetite for climbing wherever he can get it. He asked if I could come along, and I was glad to oblige. From London we took the Caledonian sleeper train overnight to Fort William. The sleeping berths weren’t quite up to “Midnight Express” sizes, or standards and only one person could really stand up at a time. Ambien and a night cap on the dinning car made sleeping easy, and we were in Fort William by 9:30 the next morning. Alan Kimber, a friend of a friend of Erik’s, met us at the train depot. Alan is a local climber and guide, and he gladly helped orient us to the town and dropped us off at the trail head. A 1:45 minute walk had us up to the famous CIC hut, an old climbers hut built in 1928 that has bunks for twelve, or so; our home for the next couple of days. From the CIC hut many of Ben Nevis’ classics are only a 40 min approach. Our goal was “Point5 Gully”, one of the 100 best climbs in the world, and the most famous of Scottish gullies. No one had any information on the route’s condition, as late January is still early for Scottish ice. Weather in Scotland can be tricky. It’s a maritime mountain range, so it isn’t very cold, with temps usually just above, or just below freezing. Heavy wet snow, or rain can come in faster than a weather report, and the winds are often from 30 -50 mph. Soft Shell isn’t a popular choice in Scotland, in fact Gore-tex isn’t good enough for most locals. Most locals can be seen wearing a brand called Paramo. It’s fast drying, but more akin to rain gear than gore-tex, and they swear by it. After having breakfast with our new bunk mates from all over Europe, we rucked up and met back up with Alan who’d come along on the route with us. We walked in the darkness up toward a large gully system that would eventually have us at the base of our route. Once the morning light brightened it was easy to see why” Point 5” is such a classic. “Point 5” is a narrow runnel that continuously expand and contracts from about 4-15’ wide for several pitches. The route is roughly 1200’ long, the first few pitches having many vertical sections, the last few pitches relax in grade. Alan sent me off without much warning, or guidance, other than “you might want to belay here”, or watch out for “runners” (fixed gear) there. It didn’t take long to start understanding “Scottish” grade V5, as the first steep section was vertical snow/slush, rather than ice. I’d already started to use positive-pessimisms,” It may be steep and insecure, but at least there’s no gear”, or “It may be steep, insecure and without gear, but at least the spin drift is refreshing”. 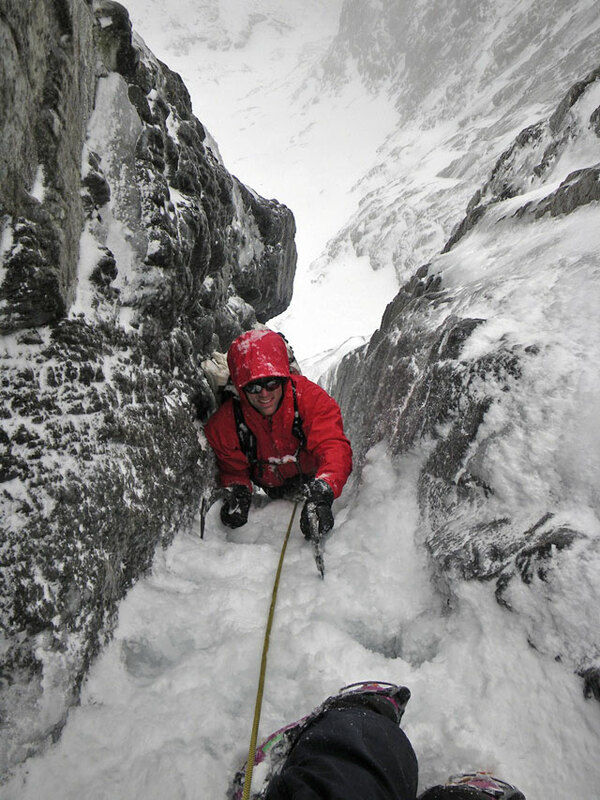 Occasionally several seconds of heavy spin drift would pour down the gully, classic Scottish conditions, on the most classic of routes. The whole characteristic of the climbing was very different than climbing anywhere else I’d been. The ice isn’t really ice; it can be ice once in a while, later in the year, but not usually. The gear situation is also very different. Ice screws won’t work very well in most of the conditions, so fixed pins, an occasional nut, or hex can be helpful. The rock is schist, so there isn’t as much opportunity for gear as you’d think, and the fixed pins become the focus. Much of the rock is covered in rhyme ice, so cams aren’t the answer either. There is water ice in Scotland, but it doesn’t abound, and that’s not their focus. It’s a different type of climbing, and the people that climb there regularly have adapted their clothing, attitude and climbing style to match. A cup of tea, a stiff upper lip, some hex’s, and clothed in their Paramo, the Scottish have a great niche. Topping out on Ben Nevis is a cool experience. Looking up from the pitch below one can see the corniced edge. That edge is abrupt, and the top as flat as a golf green. One moment climbing, the next, walking flatly along the summit. Once on top we took shelter in the very small summit hut, a left over entrance for an old observatory now in ruins. In the tiny hut we were met by a Russian in jeans who had hiked up the back side. He offered us “Russian Pork” which Alan and I could see was pure white fat. Unfortunately, Erik could not see this, and helped himself. Alan and I grinned at each other as Erik’s face contorted and he tried to find a way to remove the offensive fat from his mouth without offending our generous new friend. A short walk through 50 mph blowing snow and ice brought us to the line of cairns that the hikers use to navigate they’re way up the back side. Using the cairns and the corniced edge as a hand rail we found the top of no. 4 gully, our descent gully. Navigation on top of the Ben is important. There are cliffs on both sides of the summit, and gullies that are hard to see in the reduced visibility that is characteristic of the Ben. “Point 5” was a great experience. Meeting and spending time with Alan Kimber added to the fun and enhanced our experience of the local flavor. It’s also always fun to watch a concerned observer become an amazed observer. People often have some look of concern about the blind climber, but Erik always impresses with his amazing abilities. We had a good dinner at the hut, marred only by the fact the 6 people that had left that morning hadn’t yet returned. As time went on, the voices in the hut started to sound more concerned. Late returns from climbing on Ben Nevis were common; no one wanted to sound the alarm too early, or too late. 10:00pm became the agreed time of alarm, but at 9:30 the sound of the RAF Sea King helicopter told us all was not well. The big helo hovered over Tower Ridge, its bright light scanning the route. It left to re-fuel and return three times. Others from the Scottish rescue team arrived at the hut. They had radio communications with the rescuers on the ridge and the helo. It was a German pair that got into trouble navigating off route. They called with the last life of their cell phone. Also spotted by the helo was the British foursome who was retreating from their route, but didn’t need help. The Brits arrived at 2:30am, the Germans at 4:00am. All were healthy, but humbled. Ben Nevis has no shortage of accidents, rescues, and worse. There were already two climbers killed by avalanche earlier in the season. At less than 5000’ tall Ben Nevis doesn’t seem that tall a mountain. However, with its maritime weather, and complicated climbing conditions, it seems as serious as mountains three times its size. After a mostly sleepless night and half a day of climbing some shorter routes lower on the Ben, Erik and I started walking down towards Fort William. We wanted to visit some of the other climbing areas in Scotland, Creag Meagaidh had been recommended by local climbing legend Ian Parnell. After a day of drying, we packed our still wet gear and headed down the road in our rental car. Our little Ford KA was roughly half the size of a Geo Metro, but got 60 mpg. Creag Meagaidh is another 2 hour approach, but its summit is roughly 3500’ with less savage weather. 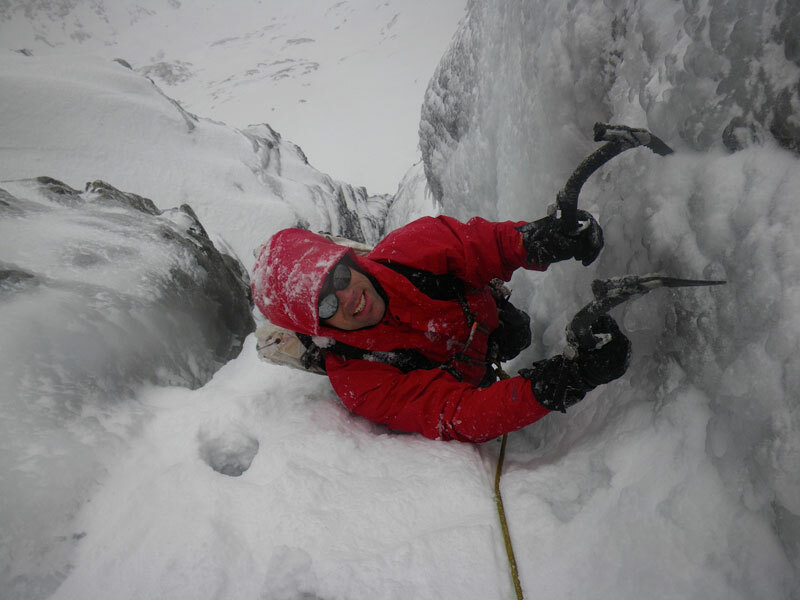 Most routes are in the 600’ range and offer characteristic Scottish snow and “ice” climbing. There were a few routes that appeared more ice than snow, but we found a classic named “the Wand V5” unoccupied. Frozen snow gully pitches led to steep snow/ice pitches, back to snow pitches and a corniced rim and a flat summit. I think we get it now; long approaches through interesting and uniquely beautiful surroundings, followed by impressive gully climbs with big mountain snow and ice conditions, and great summits. 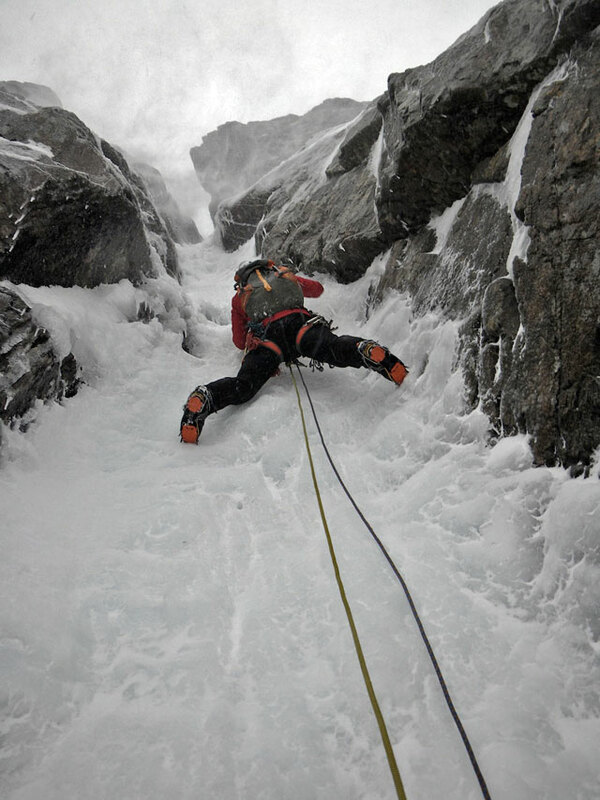 Scotland is the place where ice climbing was invented. The Victorians climbed there honing their skills before heading into the Alps and Himalaya. It was a great place to climb then, and remains a great and storied place to climb now. Great Trip Report! Thanks for taking the time to share it with us. I Love extreme challenges such as climbing Ben Nevis The Three Peaks Challenge http://the-three-peaks-challenge.info/ is the most extreme mountain endurance challenge in the UK can you do it ?